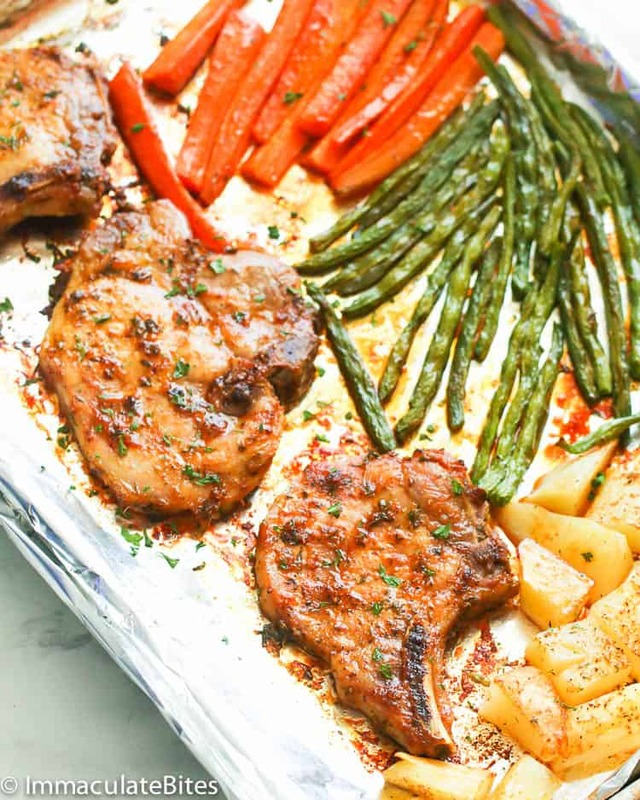 Oven Baked Pork Chops – easy one-sheet pan meal with juicy and tasty pork chops and roasted veggies on the side. A perfect family-friendly meal for a quick weeknight dinner! I did my groceries last weekend, only to find out that I haven’t cleared up all of my meat in the freezer. First off, I didn’t check out my freezer before I step out of the house. Second, I’m pretty thankful how easy pork chops are to deal with. Agree? 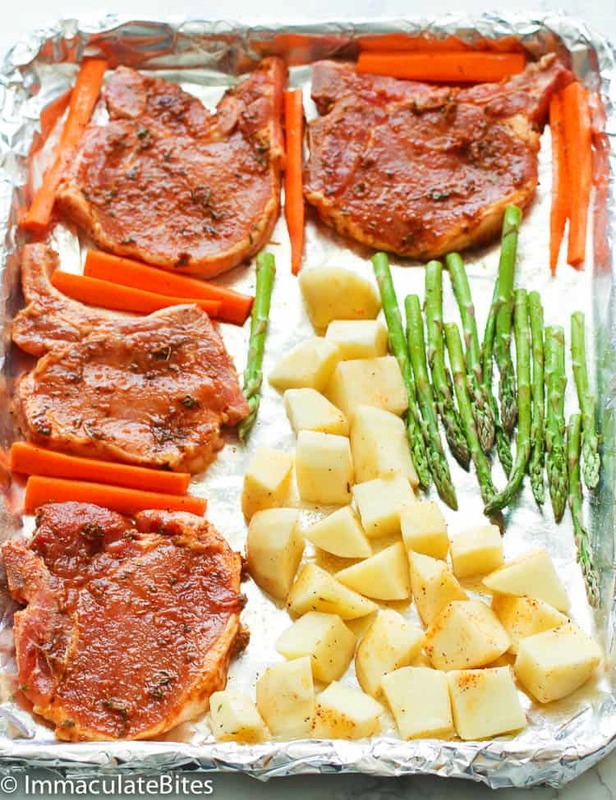 And one of my favorite way of preparing them is this Oven Baked Pork Chops with vegetables. How to season pork chops? Pork chops are without a doubt one of the easiest meat to season. You can either marinade them or simply slather with a dry rub. Whatever you choose, they always turn out absolutely great and perfect for busy weeknights or dinner date nights at home. As a matter of act, even salt and pepper would do. But I’d love to experiment! So I ended up with oven baked pork chops seasoned with my trusted homemade creole seasoning for warm flavors, along with thyme and garlic, Dijon mustard for a bit of acid and brown sugar for a bit of sweetness and a beautiful caramelization. 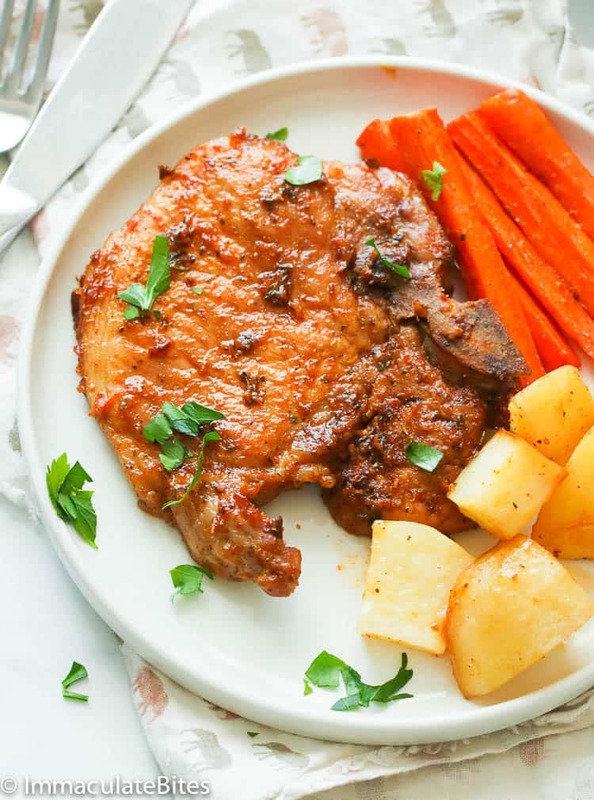 Since pork chops are a tender and quick-cooking meat cut, I always prefer to bake it in the oven as the gentle heat of the oven let us control the rate of cooking. Cooking them on a stovetop makes it absolutely easier for us to overcook them. For a bone-in chop of about a 1/2-3/4 inch thick, I suggest you cook them around 18-22 minutes at 400 F or until it reaches an internal temperature of 145 degress F. Additionally, pork chops with bone-in are quite juicier compared to the boneless one, so I highly suggest you buy the ones with bone-in. How long to bake boneless pork chops? On the other hand, if boneless pork chops are more appealing to you, you can cook your oven baked pork chops at around 15-19 minutes at 400 F. But if you have a thicker cut around 1 inch or so, try adding a few more minutes or until the thickest part reads 145 F degrees. Moreover, don’t forget to cut the potatoes no larger than 4 cm/ 1 1/2 inch in diameter, or else they don’t cooked at a prescribed time. You can cut the carrots in chunks but I prefer to have it lengthwise so it’ll cook properly. 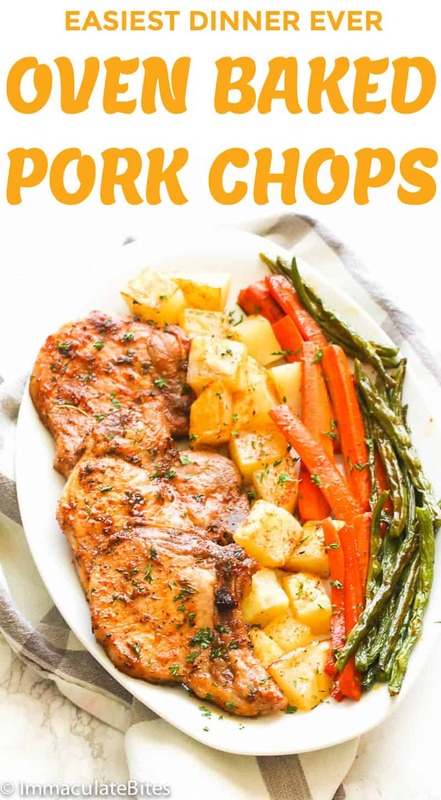 These oven baked pork chops are without a doubt a family hit even to the most picky eater you have. Want more pork chop recipes? 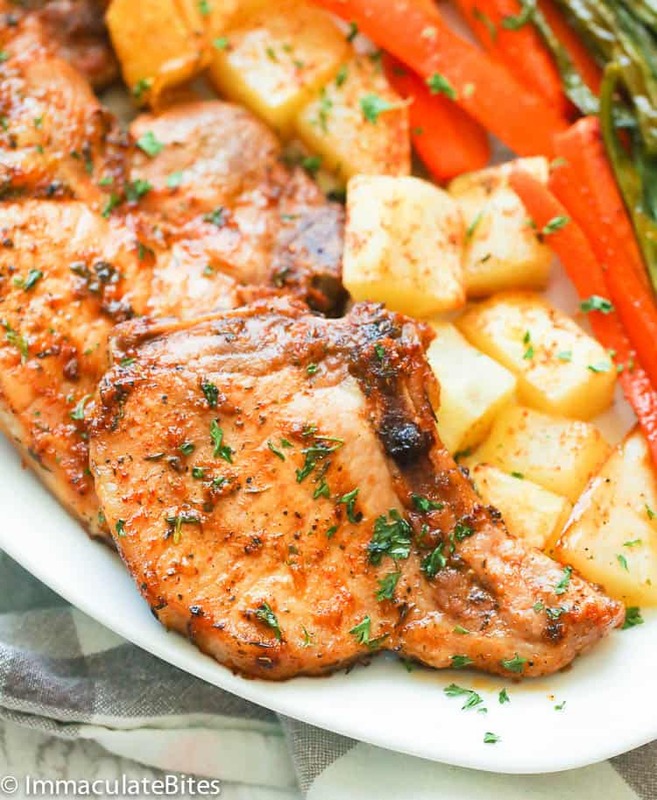 Try these easy Pan Fried Boneless Pork Chops here, Smothered Pork Chops OR this Marinated Pork Chops. 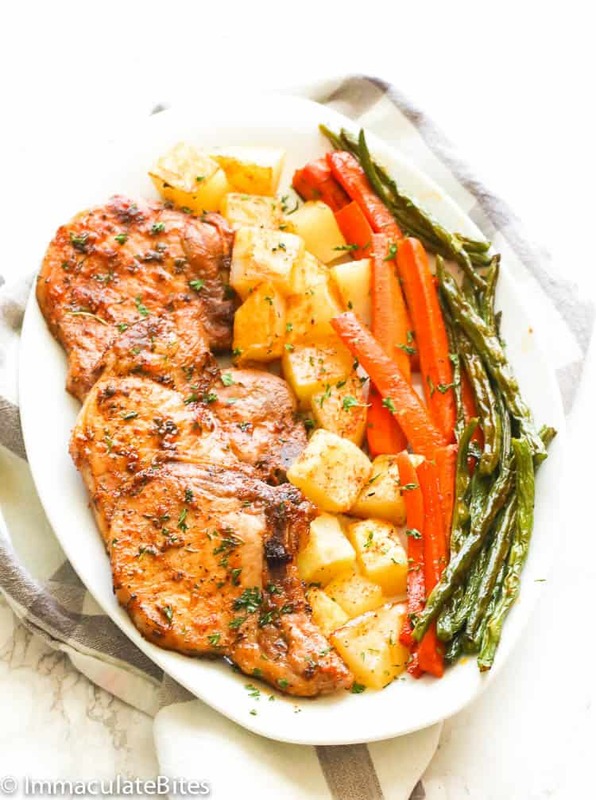 You may leave out the vegetables and just bake the pork or add whatever vegetables you wish to pair with your pork chops. Additionally, for thicker pork chop cut around 1 inch thick or so, try adding more cooking minutes until the thickest part reads 145 F degrees. Make sure to cut the potatoes small , so it cooks properly. If potatoes are not cooked, remove pork chops and continue cooking the potatoes. DO NOT over cook the pork chops. If desired, broil the chops for an additional 2-3 minutes until it caramelized. Position a rack in the center of the oven and preheat the oven to 400ºF. Line a baking or cookie sheet with foil or baking paper. Lightly, oil baking sheet or use a baking spray to grease it . Thoroughly dry pork chops, then season with salt and pepper. Set aside. In small bowl combine creole seasoning (homemade here) minced thyme, garlic , dijon mustard , worchestire sauce, sugar and oil . Season the pork with marinade then place on prepared cookie or baking sheet. In another bowl, season the potatoes with salt , oil and creole seasoning , place next to the pork chops. Place in the oven and roast until the pork is completely cooked through, about 18- 22 minutes or an internal temperature inserted in the thickest part reads 145 degrees F.
If desired broil for about 2-3 minutes, or until caramelized. Thoroughly dry pork chops, then season with salt and pepper. Set aside. In small bowl combine creole seasoning (homemade here) minced thyme, garlic , Dijon mustard , Worcestershire sauce, sugar and oil. Season the pork with marinade then place on prepared cookie or baking sheet. In another bowl, season the potatoes, carrots and asparagus (or green beans) with salt , oil and creole seasoning . Then place next to the pork chops. Place in the oven and roast until the pork is completely cooked through, about 18- 22 minutes or an internal temperature inserted in the thickest part reads 145 degrees F. If desired broil for about 2-3 minutes, or until caramelized. Serve immediately, garnished with parsley, if desired. Can I use this on chicken? Hi Kenva. You can try this Oven Baked Chicken Breast recipe here >>> https://www.africanbites.com/oven-baked-chicken-breast/ . Please do let me know how it turns out for you. These are great! Is there a similar recipe with chicken? Or would I have to modify this to make it with chicken? Some of my neighbors don’t eat pork but I think they would like the flavors. Hi, Nanette. Yes, you can or you can check out this recipe here too >> https://www.africanbites.com/oven-baked-chicken-breast/ . Please use your best judgement in adjusting the cooking time as this recipe here is written specifically for pork chops. Please do let me know how it works for you. Thank you. Made this tonight, with 3 teenagers I made two baking sheets (?) with pork chops and a deep pan with potatoes, carrot, green beans and beetroot. Great tasting! Ok, first of all, I never leave feedback on recipes I’ve tried…ever…but, this recipe deserves recognition. I made this tonight with 6 thick cut pork chops that I just brushed this marinade on and baked in two 9×11 baking dishes covered for 45 minutes. Followed the recipe completely, other than baking in covered dishes. This was absolutely amazing! Didn’t need any extra anything! My boys usually douse their chops in bbq sauce or ranch, no matter how long I marinade them. Nothing extra was needed for anyone! This was really delicious, thank you so much for this amazing recipe. 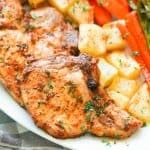 This will be my forever go to for pork chops! Excellent! How did you learn to mix the flavors?? Just a good nose? Trying this right now. I’m so excited! I just wanted to thank you for this fantastic recipe! I came to your site for the fried cabbage recipe and ended up making these pork chops and the cabbage AND the pinto beans. Even nbn CB single one was a hit! Thank you!! Awesome! So happy to hear to hear the recipes are working out well for you. I am baking with a Hawaiian sauce for slow cookers (Campbell’s) instead marinating or dry rub. Chops are bone-in (1/4 thick). I am seasoning the chops w/very little seasoning, since the sauce will add the flavor. Can’t wait to see how they turn out. I live in Cajun/Creole country (Deep East Texas) and there is quite a variety of Creole/Cajun seasonings available, but all are way to salty for my taste. 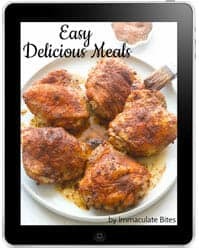 Your Creole seasoning recipe is fantastic and allows me to control the salt to my taste and in my diet. The pork chops were absolutely delicious ! Agree! I always try to make my own seasonings, where possible to be in control of the salt. So happy to hear the pork chops worked out well for you. Thanks for the feedback. Love these chops, so flavorful and tender. It’s now my go to pork chops recipe. All your recipes are well seasoned and tastey. Oh Wow, Elizabeth—I loved reading that! I appreciate your kind comment, and am thrilled that this baked pork chop is on a rotation in your household. You can make your own creole seasoning using the instructions here >>> https://www.africanbites.com/creole-seasoning/ OR use store-bought ones. Thanks for taking the time to let me know, Jessica! Enjoy! Do you have the chops with the kidney still in? You can only get them in the UK if you talk nicely to you Butcher! But I shall try this lovely recipe next week-end for the Sunday lunch. Thank you again. Thank you, I can’t wait to try this! And I agree with you about bone-in pork chops – they are MUCH better. Boneless chops do not compare.